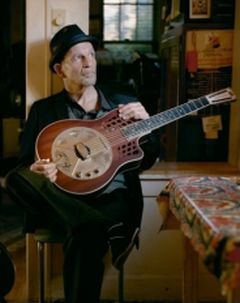 Steve James is a blues musician, a notable songwriter, one of the best modern bottleneck slide players, a storyteller and a compendium of interesting facts. In the world of contemporary acoustic and roots music, he’s earned his reputation with decades of tireless international touring, a stack of solo recordings, a funny, kinetic stage presence and an unmistakable style of playing and singing. He’s shared his creative instrumental approach on guitar, slide guitar and mandolin with books, print lessons, DVDs and on-line tutorials for Acoustic Guitar and Homespun. His own recordings engage with other top notch musicians- Cindy Cashdollar, the Bad Livers, Alvin Youngblood Hart, Del Rey and a host of others. As a sideman, both on stage and on record, he’s played with Howard Armstrong, Bo Diddley, John Hammond, Maria Muldaur, Furry Lewis and James McMurtry…he often gets a shout-out to “get on up here” from the likes of Tommy Emmanuel, Hot Tuna or Chip Taylor. Hehas appeared on “A Prairie Home Companion”, “Austin City Limits Live”, “NPR Morning Edition” and many other syndicated broadcasts worldwide. In 2014 he started a band dedicated to East Texas juke joint music (especially Lightnin’ Hopkins and Mance Lipscomb) with singer and drummer Pip Gillette called The Camp Streeters.